"Use this basic recipe to make your favorite flavored latte with a home espresso machine." Pour milk into a steaming pitcher and heat to 145 degrees F to 165 degrees F (65 to 70 degrees C) using the steaming wand. Measure the flavored syrup into a large coffee mug. Brew espresso, then add to mug. Pour the steamed milk into the mug, using a spoon to hold back the foam. Spoon foam over the top. I made this as is and it's perfect! I have been playing around with the correct measurements and now I don't have to. Thanks for a great recipe!!!! Awesome recipe. 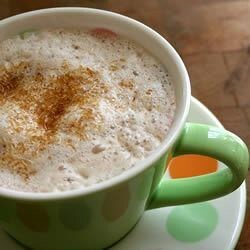 I like to use Coffeemate Warm Cinnamon Sugar Cookie Creamer to replace 1/4 cup of the milk. It gives it a deliciously sweet taste and tastes like an expensive coffeehouse drink! I thought this was really good the way it is, but for mornings, I usually like a double shot ... I need it!